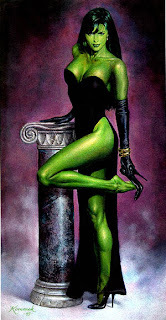 If after spending all my money on peanut M&M's and and monthly instalments of imagination in four colour print, I find myself living in a similar longbox to that of my comics, I'll only have one person to blame; She-Hulk. Prior to her I was strictly a DC guy, however DC wasn't always easy to come by this far south of the equator. The 'patch' filling the intermittent absences of the Flash, Hawkman and Aquaman; John Byrne's Fantastic Four. Initially lured into the run by the ever-lovin blue-eyed Thing, it wasn't long before he bailed, Jennifer Walters stepped in, and the addiction begun. She was smart, fun, a team player, and anyone that messed with 'Shulkie' made a BIG mistake - often finding out within the space of three panels. I was hooked. Following her, pocket-money in hand though the F.F into the Avengers (keeping both books on my pull list as I stepped into the world of wages), she continued to vacum money from my wallet, long after DC finally started appearing consistently on local news-stands. 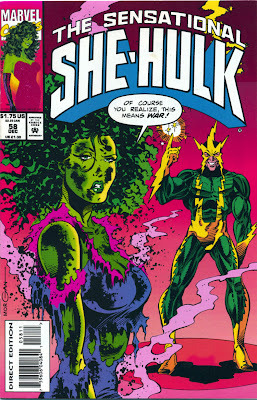 The whole point of this little time trip - this week She-Hulk's swapping turning green for turning 30. Never one to miss a chance to party, Marvel.com has given the 'Jade Giantess' a week long promotion, including a free digital read of the first issue of Jennifer's latest series.